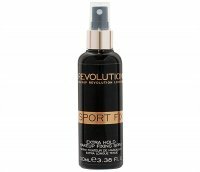 THICK FX - FIBER LOCKING SPRAY by ARDELL. Hair mist without rinsing. Perfectly strengthens hair styling regardless of weather conditions, such as wind or rain. The handy packaging was enriched with an atomizer that facilitates application. Composition ALCOHOL DENAT., WATER (AQUA, EAU), POLYURETHANE-14, AMP-ACRYLATES COPOLYMER, PANTHENOL, PEG-12 DIMETHICONE, ETHYLENE BRASSYLATE.